God wants to be with you. This message explains why. The Tent of Meeting revealed God’s deep desire to dwell with His people, though veiled in the tabernacle. The New Testament reveals how God took a step closer when Jesus “tabernacled among us” (John 1:14), how the Holy Spirit indwells us (1 Corinthians 3:16), and how one day we shall see “the tabernacle of God is among men, and He shall dwell among them, and they shall be His people, and God Himself shall be among them” (Revelation 21:3). God wants to be with you . . . forever. How’s your devotion these days? When Peter told Christians they “are a chosen race, a royal priesthood, a holy nation” (1 Peter 2:9), they assumed what we often overlook. The priesthood applied to priests specifically, but to every Israelite generally. Therefore, the timeless truths of the priests in Leviticus 8 apply to the priesthood of believers today. Serving God requires we be fully devoted to Him for life—with ears to hear, hands to work, and feet to follow (Leviticus 8:23-24). Sounds strange, but why did God want the fat? The fat represented the best of an animal, and the blood represented its life—both of which God laid claim to. As the sacrifice was a substitute for the worshipper, so the call is for believers to offer God the best of their life—healthy in mind and body, spiritually mature, giving the best of their time, and increasing in skill to the best of their ability. After all, God gave His best when He offered Christ for our sins. Next week I head to Israel with several associates to film on location! With a schedule that allows for little margin, we’ll shoot video in Caesarea, beside the Sea of Galilee, in the Judean Wilderness, and in Jerusalem. We’ll film Dr. Reg Grant performing a number of his biblical characters, and I will serve as a “host” on camera for the DVD series we’re producing for Insight for Living. 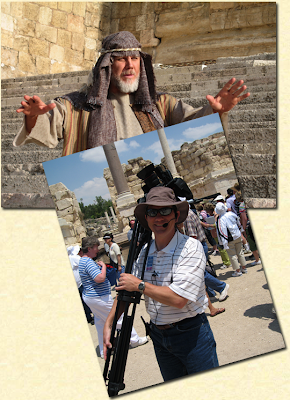 Last year we videoed Chuck Swindoll preaching at a number of biblical sites, and the footage we’ll shoot next week will spice up the finished product. No technical glitches with cameras, microphones, etc. I’ll give a follow-up and post a few pictures after I return. What do others see when they look at you? Since both Testaments call believers “a kingdom of priests,” the timeless truths of Israel’s priests apply to all believers. Namely, just as the holy attire represented God’s holiness, so what people see of us should reflect the Lord’s glory (1 Peter 2:12). Just as the fires could never go out, so we too should always be ready to assist others to find access to God (1 Peter 3:15).